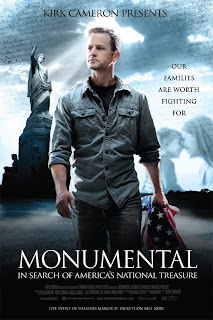 A MONUMENTAL CONNECTION BETWEEN KIRK CAMERON AND CHRISTIAN RECONSTRUCTION? Equip Blog Home / In the News / A MONUMENTAL CONNECTION BETWEEN KIRK CAMERON AND CHRISTIAN RECONSTRUCTION? March 27, 2012 marked the debut of actor Kirk Cameron’s latest movie Monumental: In Search of America’s National Treasure, which is a documentary on “the people, places, and principles that made America the freest, most prosperous and generous nation the world has ever known.” Julie Ingersoll, Associate Professor of Religious Studies at the University of North Florida, in an op-ed piece for Religious Dispatches believes viewers shall find “new, more extreme Cameron,” whose views have been influenced by Rousas John Rushdoony and David Barton. In essence she finds in Cameron a “shift from the larger premillennialist evangelical world that he depicted in Left Behind to the postmillennialist dominion theology of the Reconstructionists.” Cameron, however, has not made any formal statement on whether or not his eschatology changed. Nevertheless, Postmillennial Reconstruction is well within the pale of theological orthodoxy. Postmillennialism in all its varieties stands in contrast to premillennialism, the belief that Jesus Christ shall return to establish a future Millennial Kingdom. The most popular form of premillennialism is of the dispensational variety, which affirms two peoples of God (i.e. the sharp distinction between Israel and the Church), and two phases of the Second Coming (i.e. a secret Rapture of the Church, a seven year Great Tribulation brought on by the Antichrist, and a visible return of Christ, which begins the 1000 year reign). Many within the dispensational tradition have become drunk with millennial madness, using newspaper eschatology to make false predictions concerning the time of the Rapture. Some but not all dispensationalists even advocate a type of Christian Zionism which has monumental socio-political implications on the sensitive relations between modern Israel, Palestine, and other nations in the Middle East. John Hagee is an influential teacher advocating Christian Zionism. Postmillennialism also stands distinct from amillennialism, the belief that the millennium is a present reality for believers between the two advents of Jesus Christ. Hank Hanegraaff, in The Apocalypse Code, briefly discusses the “thousand years” of Revelation 20 as a type of vindication language, wherein God vindicates those having suffered for Christ during a short period (i.e. “ten days”) in that they reign with Christ forever (i.e. “a thousand years”). He writes, “though mistaken by many as a semi-golden age of Christian history—leading to much debate over whether the return of Christ will happen before (premillennialism) or after (postmillennialism) the millennium, or whether the millennium is symbolic of the period of time between Christ’s first and second advents (amillennialism)—the thousand years of Revelation are symbolic of the unique and ultimate vindication (qualitative) that awaits the martyrs who died under the first century persecution of the Beast.”  Moreover, Hank holds that the proper grammatical principle of biblical interpretation reveals that the great tribulation, spoken of by Jesus Christ in the Olivet Discourse and depicted in apocalyptic images by John in the Book of Revelation, concerns mainly the events surrounding the fall of Jerusalem and destruction of the temple in AD 70—albeit the Apocalypse also points forward towards the final future to the new heaven and new earth. Hank and CRI also recognize that the millennium is a secondary issue of eschatology that Christians can debate but not divide over. Nevertheless, ideas have consequences, and what one believes about the end time, whether Left Behind eschatology or Christian Reconstruction, determines how they live, and these are more than just harmless theological concepts relegated to the mind. Moreover, we encourage Christians to study the various positions and, using sound principles of hermeneutics come to a conclusion deemed most biblical (See “Practical Hermeneutics: How To Interpret Your Bible Correctly Part 1,” and “Practical Hermeneutics: How To Interpret Your Bible Correctly Part 2”). The Christian Research Journal has also addressed R.J. Rushdoony’s views on the Christian family and Sigmund Freud’s psychoanalysis. Christians should think deeply about the most pressing social issues of the day. When one does examine the source of all the great innovations of the West (i.e. monogamy, women’s liberation, hospitals, public education, capitalism, etc. ), one finds it was the result of minds deeply influenced by the Word of God. Whether or not one adopts all the tenets of Christian Reconstruction, all Christians still must come to grips with thinking christianly about every aspect of life. Kenneth Gentry, Three Views on the Millennium and Beyond, ed. Darrell Bock (Grand Rapids, MI: Zondervan, 1999), 19. Hank Hanegraaff, The Apocalypse Code (Nashville, TN: Thomas Nelson, 2007), 274-275, cf. also ibid, 256-257n.